Few things can take the enjoyment out of a great ride like, numb, tingling fingers. Kuryakyn Grips are an excellent first step to keep vibration in check, but now you can improve their legendary comfort even more! Grip End Weights quickly install on the end of each Grip adding mass & length to further reduce high amplitude handlebar vibration. Their sculpted appearance & bright chrome finish also add a high-tech look to your already hot looking grips. Choose a Single of Pair and even Black above. 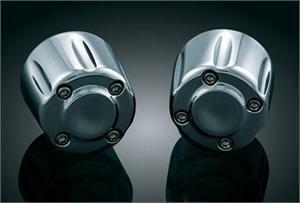 GoldWing: All Küryakyn ISO-Grips (ISO-Grips for use with GL1800 Heated Grips (P/N 6183) requires Smooth Accent Rings for proper installation.